By (Evelyn B. Avsharian) - The Children's Music Series by Evelyn B. Avsharian is the Natural Way teaching method for group or individual study that introduces the basic violin skills to young players, ages 3 and up. This supplemental series uses fast-paced, bite-sized pieces featuring easy-to-read oversized notes, stickers, puzzles and more! 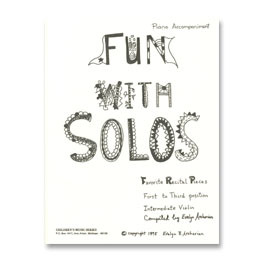 Fun with Solos includes: Perlman Concertino, Bohm Moto Perpetuo, Brahms Hungarian Dance No. 5, Kuchler Concertino, Huber Student's ConcertinoNo. 4, Seitz Pupil's Concerto No. 2, Bohm Sarabande, Mollenhauer Fantasia and Vivaldi Concerto Grosso, Op. 3, No. 11.